Memphis is a wonderful city tucked away in the beautiful southern state of Tennessee. 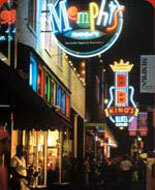 Memphis is the second largest city in Tennessee, with Nashville being the largest. Situated on the Mississippi River, this city was named after the ancient capitol of Egypt. Memphis is known for a lot of things; but Elvis Presley made the town famous with his hometown acknowledgement. Graceland-While it is free for children six and under, adults will have to pay a small fare. Visiting Graceland is worth every penny. Step inside the home of the King of Rock- n- Roll. See Elvis’ prize automobile collection and take a walk around the grounds the king called home. National Civil Rights Museum-On Mondays from 3-6 pm, this museum admissions is free. The adult tickets are $13.00 and children are $9.50 any other time. This famous museum is the site of where Martin Luther King was assassinated. Historical exhibits give the timelines and movement of civil rights from 1619 to 2000. The Children’s Museum of Memphis- Children one year and under are admitted free and everyone else is just $10.00. This wonderful center has a learning experience based with pure fun. See scientific exhibits and have fun watching the staff give scientific demonstrations to captivate their young audiences. Pink Palace Museum-All science buffs will love this fun center. Based on science, this center teaches things like the solar system with the use of a planetarium. Ticket prices are $9.75 for an adult and $6.25 for a child 6-12. Tuesdays between 1-4 pm, the Pink Palace has free admission. This museum has a Imax theater that will amaze children with life- like movies of nature. Mississippi River Museum-Explore 18 galleries of over 10,000 years of history of the Mississippi River. There are over 5,000 artifacts for one to enjoy and two life- size boats to jump aboard and explore. Visitors can purchase a Mississippi River Package which includes a train ride, museum tour, and walking river tour all for $10.00. The Fire Museum of Memphis-This is a must- see for all firefighters. See the history of fire fighting in Memphis and learn about fire safety. Tickets are buy one/ get one free on Tuesdays and the admission price is $6.00 for adults and $5.00 for children. Brooks Museum of Arts-Discover fascinating art pieces in this unique museum. On Wednesdays, tourist are invited to pay what they can. This can include anything from one penny and up. From Monet to R. Lock, visitors will have fun viewing the talented skills of features artists. They have special exhibits that are constantly changing to captivate visitors. With so much to see and do, Memphis is the perfect place to get away and not spend a fortune. With all of these museums to visit, the whole family can fill their days with history and enchantment and their evenings with fine cuisines and relaxation. Check out https://www.trustedtours.com/store/memphis.aspx for great deals on tickets to top Memphis tours and attractions.